Caution: This post is more than a year old. Be sure to check for more up to date information. The Northern Health and Social Care Trust (NHSCT) and Yarra Software have recently signed a revenue sharing agreement in relation to a new ‘clinical intervention’ software, EPICS, (Electronic Pharmacist Intervention Clinical System) which was developed in conjunction with the School of Pharmacy at Queens University of Belfast. In hospitals it is the job of the clinical pharmacists to ensure the safe and effective use of medicines. The medicine may not be having the required effect, the patients may be taking too much or too little, there may be adverse side effects or two medicines may interact adversely. If pharmacists discover problems with a patient’s treatment they carry out a ‘clinical intervention’ to ensure that the therapy will be effective and free from adverse effects. “Traditionally, pharmacists have recorded their clinical interventions using site-specific paper-based systems. However, although they share some common attributes, the recording forms have never been standardised among healthcare Trusts,” said Peter Beagon, Senior Pharmacist, NHSCT. The pharmacy staff at Antrim Area Hospital have automated the entire process of clinical intervention with the new bespoke EPICS software application. Now, pharmacists carry their pocket PCs loaded with the software so they can quickly and easily record their clinical interventions on a continuous basis and the software automatically generates monthly reports. In addition the latest enhancement will enable these interventions to be incorporated into the Trust Incident Reporting system thereby facilitating detailed analysis and subsequent learning from key medication–related incidents. At the signing of the EPICs agreement. From left, seated, Mr Michael Martin, Yarra Software; and Colm Donaghy, Chief Executive NHSCT. 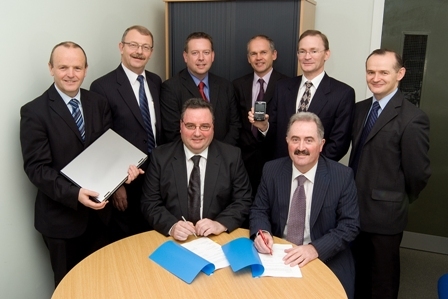 From left, standing: Professor Mike Scott, NHSCT; Professor James McElnay, Pro-Vice Chancellor, Queen’s University of Belfast; Dr David Brownlee, HSC Innovations; Dr Peter Flanagan, Medical Director NHSCT; Mr Peter Beagon, Senior Clinical Pharmacist NHSCT; and Dr Des Rooney, Director of Research and Development, NHSCT. Tell us about it - click here. © 2019 HSC Innovations - Terms & Conditions Supported by the HSC R&D Division, Public Health Agency.